Since 1 October it is obligatory for customs clearance requests to be sent electronically, under the new rules laid down by the UCC (Union Customs Code, i.e. the EU customs legislation). 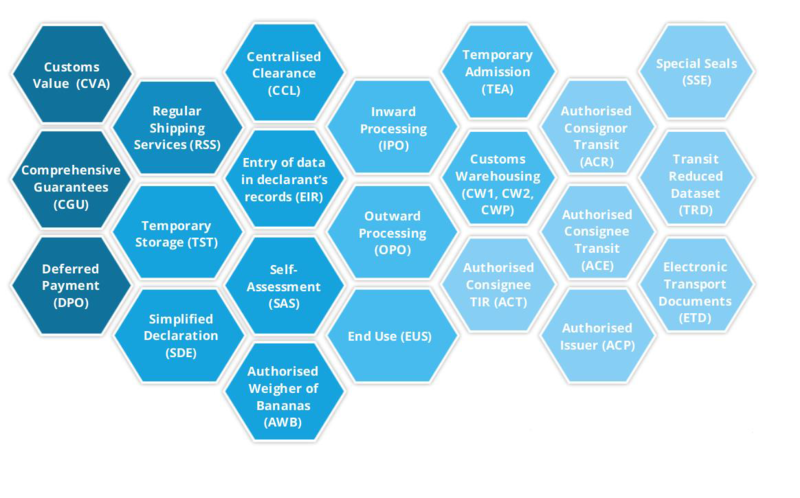 A brand-new, pan-European electronic system now permits requests for 22 different types of customs clearance to be submitted by electronic means (see graphic below). As of 2 October this is obligatory for all economic operators in EU member states. The CDS (Customs Declaration Service) is one of the results of the UCC which came into force on 1 May 2016, aimed at among other things streamlining the customs processes. This CDS must be used by the economic operators as well as by the customs services, to apply for customs clearance as well as to grant, cancel, suspend, revoke and/or amend it. An economic operator wishing to submit a customs clearance request has to log in to the EU Trader Portal, the central platform developed for this purpose by DG TAXUD. To gain access to the system the economic operator must first log in to the application run by the particular national customs authority. There they can obtain a user account with which they can log in to the CDS portal. Requesters must have an EORI number which has to be registered in the country for which clearance is required. There is an e-learning module that explains the various steps that have to be taken by requesters: https://ec.europa.eu/taxation_customs/eu-training/general-overview/ucc-elearning-programme_en. It is important to specify where clearance is being requested for. Theoretically it is possible for the economic operator to request clearance for all member states, but this inevitably means a long waiting time as permission has to be obtained from all the national customs authorities concerned. validity in one member state. Level playing field between all economic operators in de EU, irrespective of the scale of operations.